Young people in Somalia have known conflict and poverty of their entire lives recent decades and many have displaced and witnessed brutal violence against other young people which is so misfortune, however, young Somalis have often demonstrated remarkable resilience and resolve to survive if they would get with adequate support, guidance and vocational trainings, they can become strong social foundation for building peace and their lives of their community. 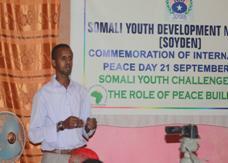 Background of the Program: The commemoration of the event of International Peace Day on 21 September, 2011 was organized by SOYDEN in collaboration with NAYD Somalia held at the SOYDEN Office, the event which its well organized and implemented by the host organization was participated many different youth organizations from south-central Somalia and Mogadishu as well and the Minister of labour, Youth and Sport was of the among the prominent figures from TFG whom attended at the event, and the event was successfully end. Problem background: Youth are the backbone of the community and the future leaders therefore it is prudent and indispensable to support and assist the youth to educate and encourage them in contributing to the development of the community. 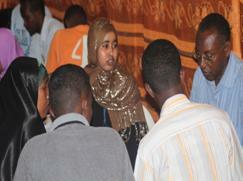 The short time NAYD Somalia had existed implemented youth programs through its organization network so as to increase the youth’s capacity to find employment or self employment opportunity and to achieve greater self reliance. Basic marketing skills are thought so as to provide accurate information on market realities. This will provide the graduates the ability to access sustainable livelihood opportunities. the youth empowerment would be achieved through illiteracy eradication and establish technical and vocational training so as to bring forth skilled youth and professional that would be qualified for the respective job that would be assigned. There is a need to mobilize and orient the youth to make them a positive and progressive minded that would make the community a working community with the pros of a positive change in the community life style. Recommendations: Should include how to overcome constraints and continue to held many other program like this in order to develop the capacity of youth and lessen the ignorance.